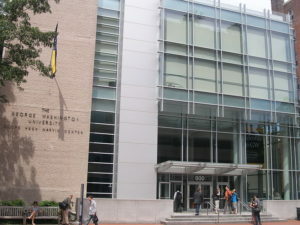 The George Washington University (GW, GWU, or George Washington) is a private research university in Washington, D.C. Charted by an act of the United States Congress in 1821; GWU was founded based on the wishes of George Washington, 1st President of the United States, for a national university within the nation’s capital. GW’s location in the heart of Washington, D.C., provides for unparalleled access to leading international institutions, multinational corporations, global media outlets, and the governments of 177 countries via their resident embassies. This is a singular advantage—no other university has as much potential for international engagement within footsteps of its doors. The Cloyd Heck Marvin Center is a GWU community center conveniently located in the heart of Washington, D.C that allows visitors to get a hands-on, immersive experience at the center of one of the worlds most politically, culturally and intellectually charged cities. Marvin Center’s is close to three major airports, including Ronald Reagan Washington National, Washington Dulles International, and Baltimore Washington International. Public transportation is at your doorstep with the Foggy Bottom/GWU Metro stop on the Orange, Blue and Silver lines located right on campus. You will have the opportunity to visit major institutions that are world leaders in their fields, such as the World Bank or the National Institute of Health. Culture vultures, diplomats and outdoor enthusiasts dig this riverside neighborhood best known as home to the Kennedy Center and the State Department. Other landmarks include the U.S. Department of State, where the art- and antique-loaded Diplomatic Reception rooms can toured by appointment. Look for Chippendale furniture and rare landscape paintings. The IMF and World Bank make their homes here too and lend an international vibe to the whole zone. The Watergate building, site of the 1972 Democratic National Committee break-in that ignited a scandal, still holds apartments and a recently rehabbed hotel with a fab rooftop bar. In the West End, upmarket restaurants include the Michelin-starred Blue Duck Tavern for elegant seasonal American fare like local oysters, wood-fired vegetables and duck. Washington, D.C. is home to many world-renowned museums, as well as many of the United States’ national monuments and memorials. Experience U.S. history and culture firsthand while visiting these impressive sites.